The Pardee & Conserving Carolina White Squirrel Hiking Challenge 4 introduces eight new hikes that take you, your friends, and family out on Conserving Carolina-protected lands—up mountains, over streams, through forests and back. There is something for everyone, from gentle strolls to more strenuous climbs. Enjoy expansive views, blooming wildflowers, tumbling waterfalls and hallowed historical grounds while staying active, getting some fresh air, and experiencing the protected lands you make possible. Use this form to report and track your progress. The Pardee & Conserving Carolina White Squirrel Hiking Challenge 4 has only a few rules and guidelines. Hiking Challenge 4 Champions who are Conserving Carolina members or Pardee participants receive an award package (including the white squirrel patch) upon completing the Challenge. There is no minimum or maximum time requirement for participants to complete the eight hikes. Hikes may be completed alone or with a group. No hikes taken prior to September 22, 2016, may be counted toward Hiking Challenge 4. 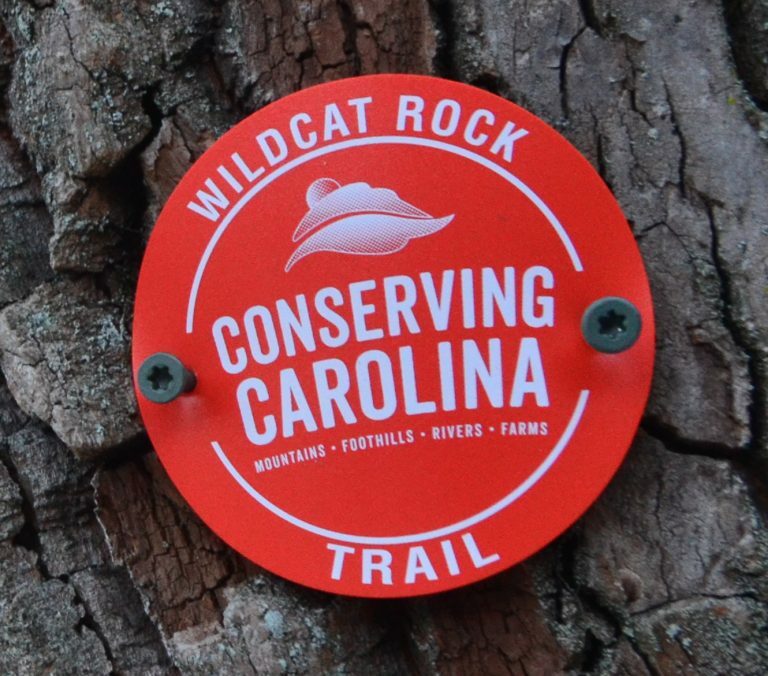 You do not need to be a Conserving Carolina member to participate in the Hiking Challenge, but you do need to be a Conserving Carolina member to receive your award package and white squirrel patch! Q: Why should I take the Pardee & Conserving Carolina Hiking Challenge? 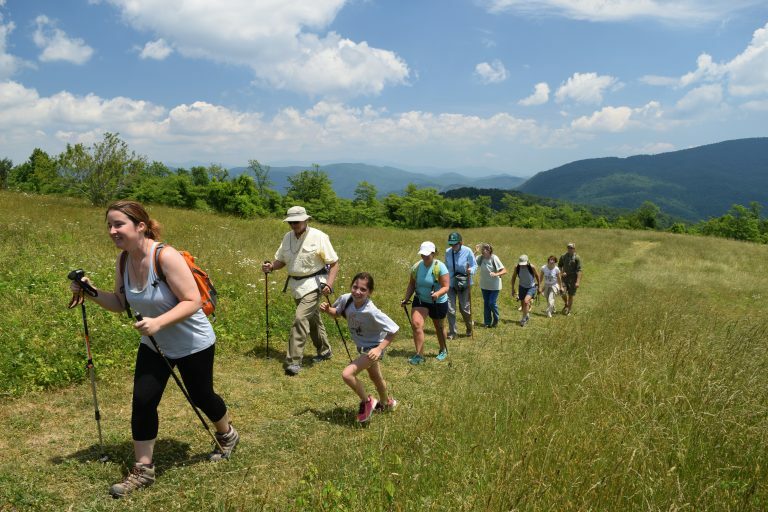 A: If you like the outdoors and want to preserve the beauty of our mountains, foothills, rivers and farms the Pardee & Conserving Carolina Hiking Challenge is perfect for you. By simply hiking and becoming a Conserving Carolina member, you will be supporting our mission in saving our most spectacular places. It is a fun way to explore our conserved lands on your own schedule, work toward an achievable goal, and earn a badge of honor (our white squirrel hiking patch) and free hiking gear for your efforts! Q: Do I need to be a Conserving Carolina member to participate in the Hiking Challenge? A: While anyone may take the hikes in the challenge, you must be a Conserving Carolina member to receive your congratulatory award package after you have completed all eight hikes. We appreciate your support of Conserving Carolina’s conservation and trails mission with your membership! Q: Does my husband/wife/children need to have their own Conserving Carolina membership to earn the patch in the Hiking Challenge and earn a patch? A: Only one person may receive an award package (and patch) in the Hiking Challenge with a “Conserving Carolina Individual Membership” ($35); multiple members of the same family or household (husband & wife, children, visiting family members, etc.) may receive an award package (and patch) in the Hiking Challenge using a “Household Membership” ($60). Q: Is there a time limit to complete the Hiking Challenge? A: No, you may complete the list of hikes at whatever pace you choose. Some hikers may complete all of the hikes in only a few weeks or months, while others may collect them over several years. The Hiking Challenge is designed to allow you to explore the outdoors and our conserved lands at any pace you choose! Q: I've already hiked to several of the places on the hike list. Can I count hikes that I've already done towards the Hiking Challenge? A: Hikes must be completed September 22, 2016 or later. Hikes prior to this date may not be counted toward the Hiking Challenge and need to be revisited. Q: Does the hiking challenge cost anything? A: The Hiking Challenge is free to Conserving Carolina members! Q: Do I need to specifically sign-up for the Pardee & Hiking Challenge? A: No, but make sure to submit completion of your hike after each one that you take using the “Log Your Hike” button on the main Hiking Challenge webpage, and include all of your contact information for each submission. Logging the Hiking Challenge allows us to track your progress toward your completion, periodically recognize your progress in our publications, and enable you to receive communications and updates specific to the Hiking Challenge. Q: Do I need to attend guided or group hikes to complete the Hiking Challenge? A: No, hikers have widely varying interests, physical abilities, and availability to get outdoors. Many people also prefer to enjoy the beauty of the outdoors in a solitary manner as a time of personal reflection. The Pardee & Conserving Carolina Hiking Challenge is designed to give outdoor enthusiasts the ability to enjoy and explore Conserving Carolina’s conserved lands at their own pace and on their own schedule. Q: I completed all of the hikes in the Challenge. How do I receive my patch, certificate, and free hiking gear? A: After reporting your eighth and final hike using our Report Your Hike form, we will send your patch, certificate, and hiking gear by mail to your membership address. Please allow 6 to 8 weeks to receive your award package that includes your white squirrel patch. Q: What kind of fitness level do I need to complete the Hiking Challenge? A: The Hiking Challenge can be completed by people of most fitness levels or levels of outdoor experience. Q: Can I just buy the patch? A: No, the patch must be earned by completing the list of eight hikes. The White Squirrel Patch is one of the most prized hiking rewards in our region! Because several hikes in the Hiking Challenge are within reasonable proximity to each other, the most efficient way to complete the Conserving Carolina Hiking Challenge is to combine two or more hikes in one day. Print out driving directions and trail descriptions at home before leaving for your hikes. Carry plenty of water on each hike. Dress in layers and be prepared for wet weather and drastically changing temperatures. Even when short in distance, many trails are very steep; bring a hiking pole or walking stick. 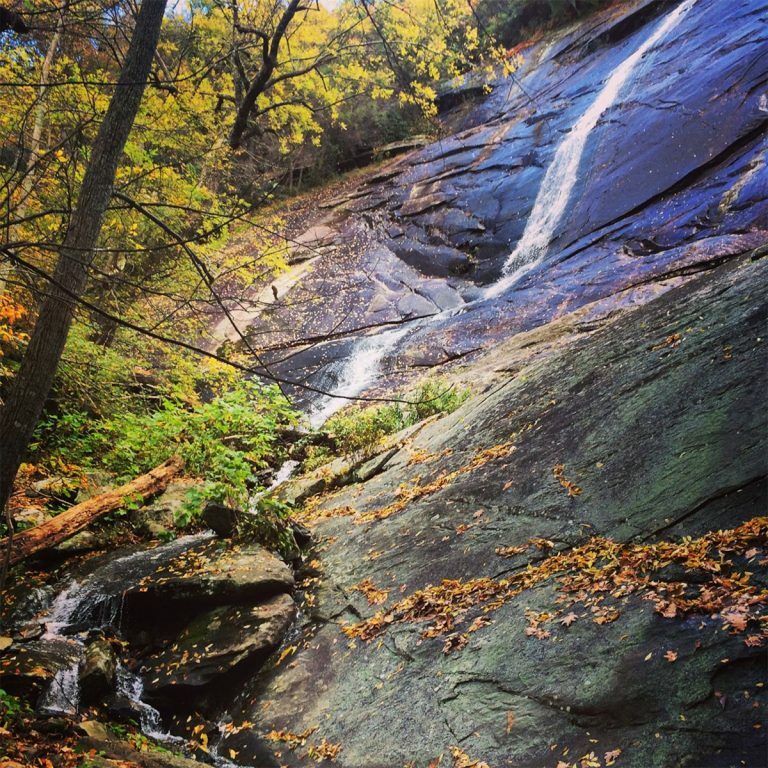 Challenge hikes will take you to many of our most scenic locations: bring a camera! Find hiking buddies, organize carpools, and share stories and photos of your hikes with us on Facebook, Instagram, or Twitter!